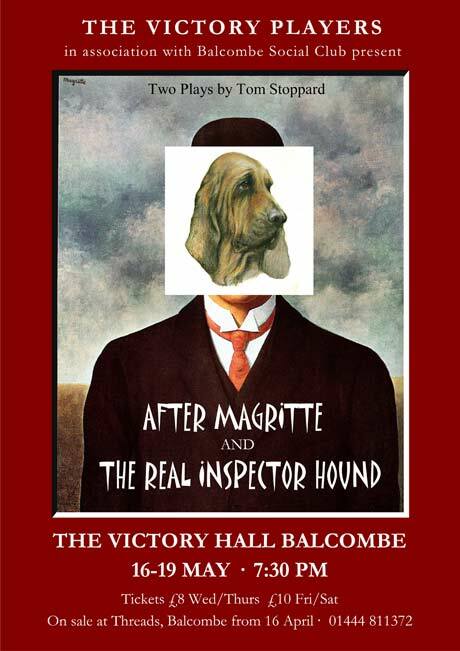 From Edwardian Music Hall last year to the surrealist drama this may, nobody can claim that the Victory Players are not versatile. But their recent performance of “After Magritte” left us asking ‘what on earth was that all about?’ Difficult to say, really. Magritte was a surrealist painter who juxtaposed ordinary happenings in unusual settings. Hence, in this play, author Tom Stoppard put a husband, wife and tuba-playing mother-in-law in what seemed a normal domestic situation, only for it to descend into incoherence when the law takes its own misguided hand. The clever dialogue was well delivered, but if you want a satisfying build up of plot with a happy ending, this was not for you. Their second Stoppard play, “The Real Inspector Hound”, was equally bizarre, but more easily followed. I think! Again, totally unbelievable, and with very witty dialogue and extravagant characters, who never seemed to stay the same people from one minute to the next. The setting was a theatre where two critics sat at the side of the stage pontificating on what direction the play should take – in a manner certain to find place in Pseuds Corner in Private Eye. They share my ‘Best Actor’ awards. The love interest centred around Lady Cynthia, with a secondary theme of a dangerous madman on the loose. Her two suitors both got shot, hearts got broken, Lady Cynthia said she would be faithful only to her missing husband Albert. Two bumbling policeman got involved (as in the Magritte play), and the two critics got drawn into the stage action. Still with me? But all was not what it seemed – the surrealist movement has a lot to answer for. One of the critics was really a policeman, while the policeman became the critics. A wonderfully choleric major in a wheelchair turned out to be husband Albert, but who actually also a policeman in disguise. Oh dear! At this point I started to get lost and sympathised with one character who said despairingly, “Does this play know where it is going? Where is God?” Don’t even mention the body (actually a stuffed dummy) which mysteriously lay under the sofa during the play. Enough of the ‘plot’. The acting was extremely good and the script very funny. The sets and props, too, were absolutely right in their 1960s disguise. Congratulations to the performers in both plays. If the audience found them puzzling, then pity the poor actors! 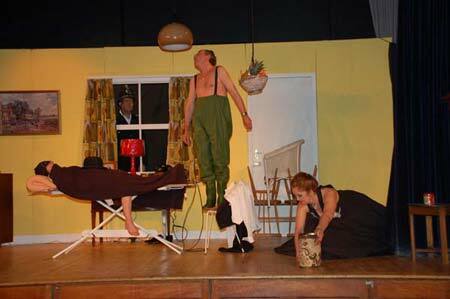 More photographs of both the plays are available from the PHOTO GALLERY index. CLICK HERE to view a PDF file of the programme for the two Tom Stoppard Plays, or right click and select "save target as" (277 KB).